One way, Jesus. You're the only one that I could live for! I'm thankful that He found a way for me to join YFC. I never thought that three whole days with Him can change my life. I'm determined to be a better person. I'm willing to offer my life for Him. He is my life. He is my salvation. He is enough for me. I am Your servant, You are my Master. Let Your will be done. Today I went to ATC with my tita and my grandparents (mom's side) to celebrate their 47th wedding anniversary. We ate at Dad's and got ourselves a free lobster stuffed toy. Haha. Then we went to National, then to PowerBooks (I bought a new book!! Whee! ), had a sip at Starbucks then went home. We all looked at the developed Thailand pictures from our cameras. It was all so nice! Some were really funny, and some were just really beautiful. I still don't know where our camera is so I still can't post the pics here, but really, I'll ask my mom about it later. Anyway, I'm currently reading The A-List by Zoey Dean. I've read reviews about it and it's recommended for Gossip Girl fans. I'm still not sure if it's as good as GG, but so far, so good. I forgot to tell you by the way, that while in Thailand, I grabbed myself a copy of Angels and Demons and it IS sooo great. I tell you, it is nothing compared to The Da Vinci Code. Nothing! It even actually made me examine myself and my faith after reading. I like books like that, you know, books that make you think. It doesn't matter if it's a chick-lit book like Gossip Girl or a classic novel like Angels and Demons, as long as it makes you think about yourself after you put it down. If it makes me survey myself, and makes me realize something about myself, then it's a good book. So I suggest to you my fellow bored-mates that you go to the nearest book stores and get the hang of reading because I tell you, it really does wonders for the mind, the heart and the soul. 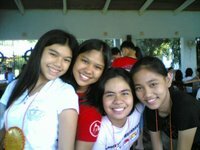 Dikitsies: Me, Nica, Aica and Mikka. 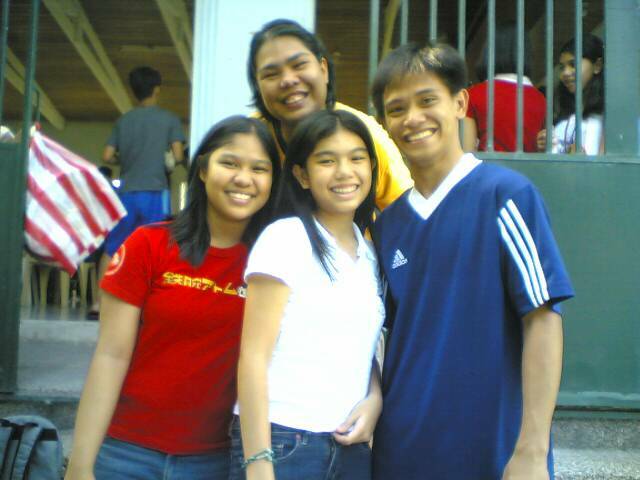 Ate Fhatz, Nica, me and Cocoy. Aica, Mikka, Nica and I were all thinking of really corny and jologs pick-up lines during our breaks at the Youth Camp, and trust me, total laugh trip! "Are you a crayon? Kasi you bring color to my life eh." "Asthma ka ba? Kasi you take my breath away." "Are you a puzzle? Kasi you complete me eh." "Where's your tag? Coz I swear you're made in heaven." "Here's something wrong with my eyes..I can't take them off you." 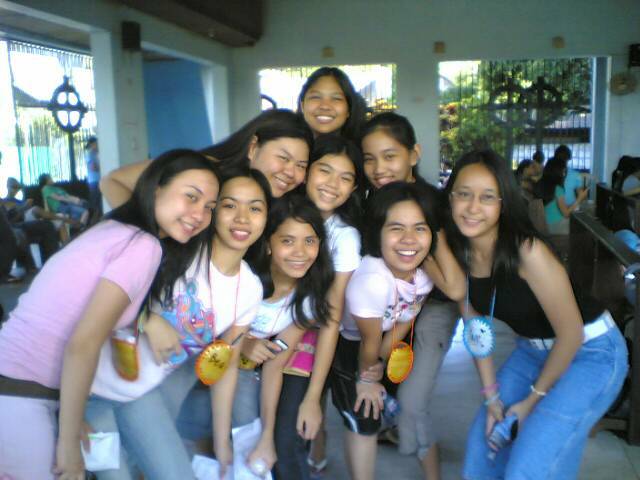 and the jologs-est of them all!! Friend: "Nasan si [yung name ng crush mo]?" Waah! Super kajologsan to the highest level. =) Miss you, Dikitsies! Mwah. I know now You're my only hope."